The Bible is relevant for the situations we face today. It is relevant to our culture. When you sit down to read your newspaper or news periodical you do not have to be left with ethical questions and moral doubts. God’s Word has answers that we need. It is relevant and has answers regarding our personal, community, national and global problems. 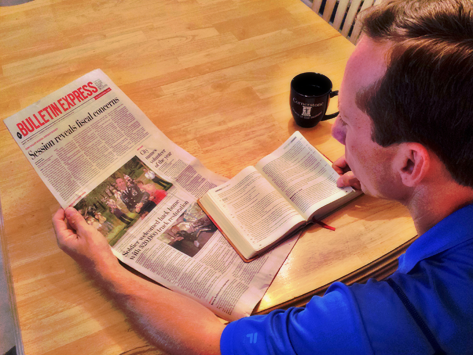 As a pastor or Bible teacher you will want to prepare your people to face the world with an awareness of the current news and an open Bible. Teaching that is relevant to today’s culture. These are things that every Bible study teacher strives for and astute pupils long for in their class. This can be yours today. You don’t have to have any additional training. You won’t have to do hours of research and preparation. We have done it for you. We offer complete affordable teacher’s lessons with student handouts ready to teach. They are non-denominational and are suitable for all Christian churches and Bible study groups. Each week fresh new Bible based material will be available showing how a Christian should respond to national and world news issues.